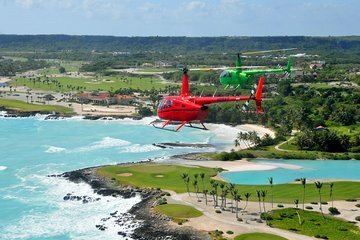 Tenha uma visão panorâmica de um dos destinos mais populares da República Dominicana neste passeio de helicóptero saindo de Punta Cana. Você planará pelas praias do sudeste do país e verá o local onde o deslumbrante Mar do Caribe se encontra com o frio Oceano Atlântico. Escolha entre uma experiência de 10 a 40 minutos, que inclui a Praia do Bavarao, a Lagoa de Bavaro, a Praia de Uvero Alto ou a Praia de Macau, dependendo da duração do passeio. Este incrível passeio de helicóptero saindo de Punta Cana começa com a coleta do hotel. Desfrute do conforto e conveniência do transporte de ida e volta para o aeroporto. Na chegada, você receberá um briefing de segurança antes de encontrar seu piloto especialista e partir para os céus limpos do seu helicóptero para quatro passageiros. Ouça seu fone de ouvido bidirecional para comentar os destaques, pontos turísticos e monumentos de seu guia amigável. Este incrível olhar de pássaro na República Dominicana termina com uma viagem de volta ao seu hotel em Punta Cana. Um ótima maneira de conhecer punta Cana. Reservei um passeio para duas pessoas (eu e meu esposo). Fizemos o sobrevoo somente com o piloto, sendo assim um passeio praticamente exclusivo. O piloto fez questao de sobrevooar o nosso hotel e tivemos a oportunidade de tirar fotos incriveis. Staff was very friendly and attentive. It was a great experience to be able to fly over punta cana and see all of the resorts. I would definitely recommend! A must do if you go to Punta Cana! This is something that I've always seen and wanted to try, but I wasn't sure if it was for me as I am not one who cares for flying and am very, very claustrophobic....did I mention VERY? I can tell you that I LOVED IT!! I only did the 10 minute tour, which seemed longer, but it was enough for me and I don't regret doing it. I will say that if you are claustrophobic, ride in the front. Once I got out of the backseat and into the front, I felt so much better. The helicopter pilot was so kind...and it didn't hurt that he was easy on the eyes....Hell, who am I fooling...he was fine as frog hair! :-) He took us along the whole beach line so you saw all of the resorts on the beach. I didn't know there were so many. I also got to see the beautiful golf course, trees, the roads and some beautiful things in the water like a sinking ship and a heart. Don't cheat yourself...try it! It was a great experience for me that I don't regret. Amazing ride with very friendly staff. After we arrived in Punta Cana, it took over an hour on the phone to confirm the tour and arrange for pick-up at our hotel--the local number provided by Viator was wrong. We originally booked a 10 minute helicopter tour, but the driver who drove us from the hotel to the helipad pushed us so hard that we agreed to pay the upgrade to a 15 minute tour. Unfortunately, it was raining on the day of our tour, and after spending 30 minutes driving to the helipad and then waiting at the helipad for an hour, they cancelled our tour and rebooked us for another day. On the rescheduled day, they overbooked and we had to wait for an hour at the helipad before our helicopter departed. Our 15 minute tour was really just 7.5 minutes of sites the pilot went the exact same route there and back and we saw the same sites there and back. The pilot barely spoke English and didn't provide any information whatsoever. We invested way too much of our precious vacation for this disappointing, expensive excursion.